The Dim Sum Diaries | Lung King Heen | "One cannot think well, love well, sleep well, if one has not dined well." Some may wonder how one Chinese restaurant can truly stand itself apart from the rest. 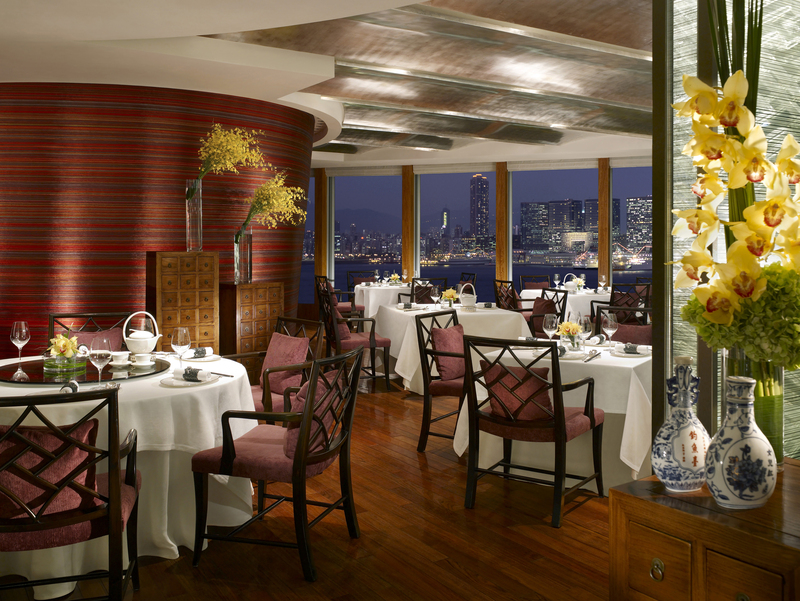 Lung King Heen at the Four Seasons, the first and only three-Michelin-starred Chinese restaurant in the world, proves, with style and charm, exactly how this can be done. As you enter, you immediately notice the star-class service and beautiful, elegant décor of hand-embroidered silk and glass screens, comfortable leather chairs and of course the floor to ceiling windows that show off the gorgeous view of the harbour, or ‘view of the dragon’, to which the name translates. Almost as soon as we were seated, the restaurant’s cheery and slightly mischievous sommelier, Bernard, sauntered over to offer us some Champagne from his Champagne cart; how could we turn him down? And, more importantly, why do more restaurants not have Champagne carts?! Happily sipping on our bubbles, whilst taking in our city’s gorgeous view, a lotus root and prawn amuse bouche appeared before us to enliven our taste buds and get us even more excited about our imminent feast (as usual, we may have over-ordered just a tad). The chef’s signature appetiser selection offered us miniature versions of four incredible starters: crispy eel with sweet soy sauce (amazingly meaty and succulent, with a sweet, satisfying yet delicately crisp exterior); crispy scallop with pear and Yunnan ham (an unexpected yet delicious combination of sweet and savoury, crisp and tender); char siu (one of the best I have tasted – so juicy and meaty with hardly a trace of fat); and barbecued suckling pig (unbelievably crispy skin and ever-so-succulent pork, served atop a slightly strong-flavoured Japanese shiso leaf). I could probably have been content with just this starter. 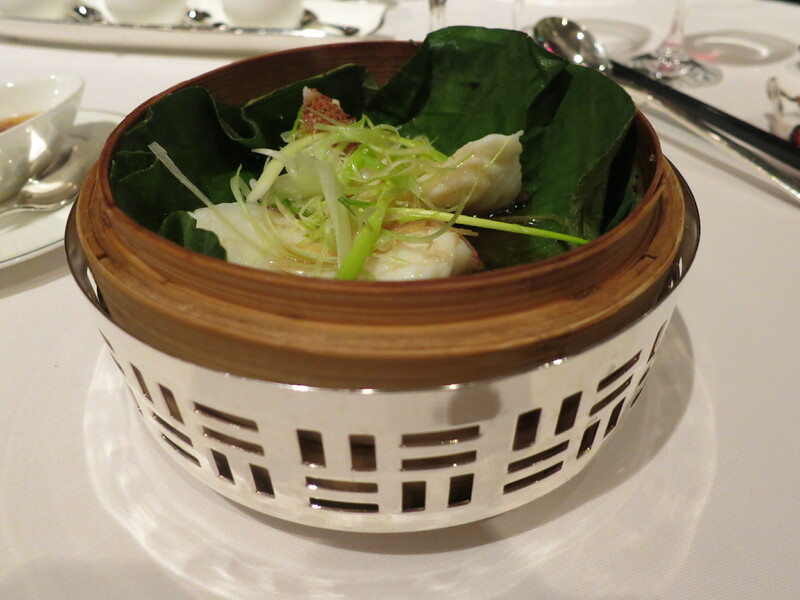 The dishes kept on coming, however, starting with individual portions of beautifully presented steamed star garoupa fillet with ginger and spring onions. This faultless fish was as tender as could be, and carried a lovely, comforting flavour. 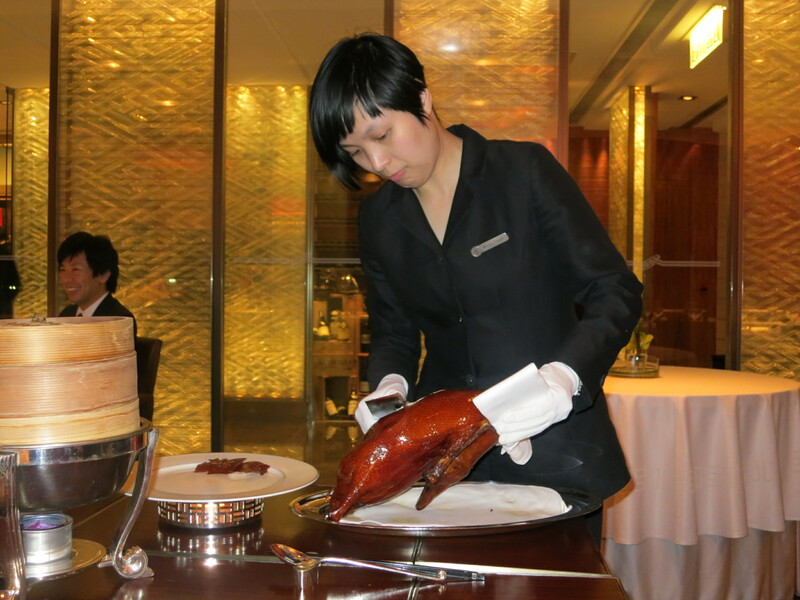 The roast Peking duck, which must be ordered at least six hours in advance, was exquisite. 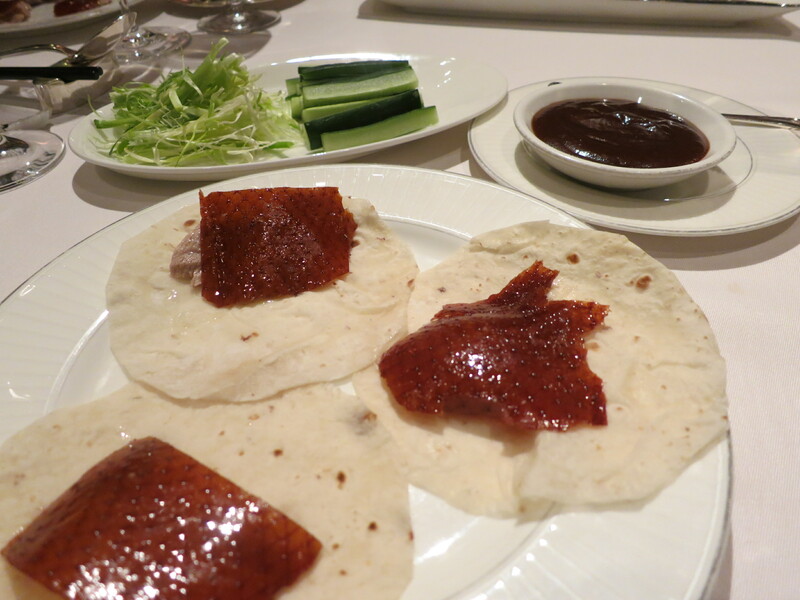 The skin, carved up in front of our table, was perfectly crisp and full of flavour, complemented by the hoisin sauce, spring onions and cucumber, and wrapped up in a soft pancake (which I sadly had to miss out on) – the flavours and textures were enough to create heaven in your mouth. 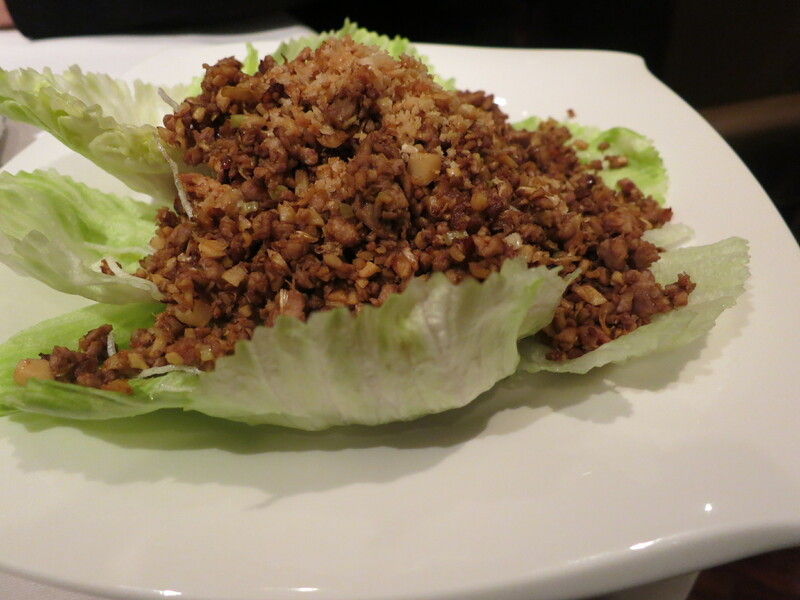 The rest of the duck was taken away and brought back several courses later as stir-fried minced duck in lettuce wraps. This has been one of my favourite dishes since childhood, and Lung King Heen’s version did not disappoint. Unable to decide between two prawn dishes, we ordered smaller versions of both: wok-fried prawns with crispy green pea purée and sautéed prawns with steamed eggplant in spicy plum sauce. Although I thought I would prefer the latter, the sauce was a little too rich and sticky for my liking. 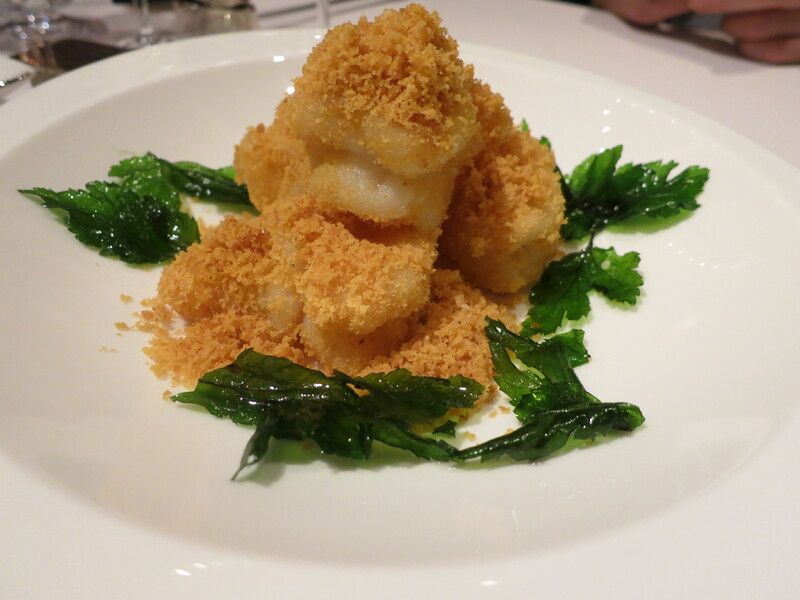 The wok-fried prawns, however, were excellent, simply dressed in an interesting yet delicious green pea crumble. 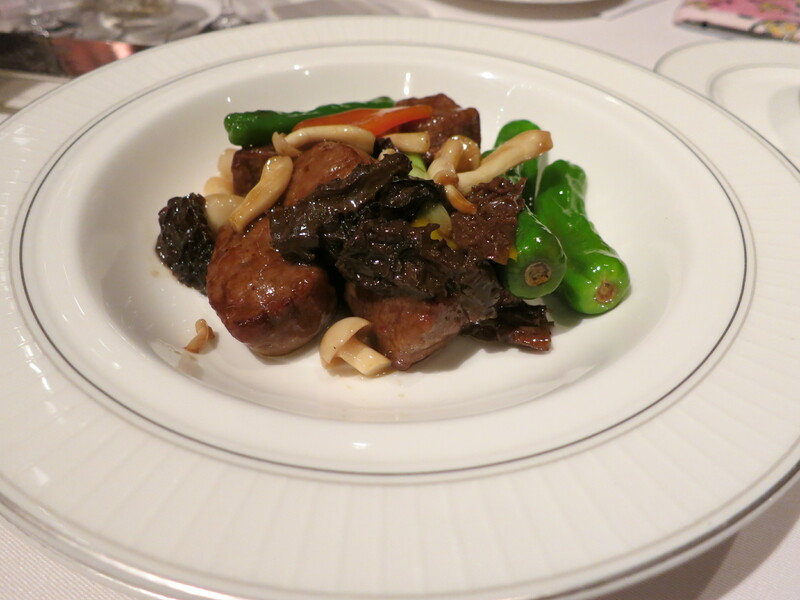 The wok-fried superior Australian Wagyu beef cubes with morel mushrooms were certainly superior; each bite of beef was wonderfully tender and beautifully flavoured by the rather pungent mushrooms. 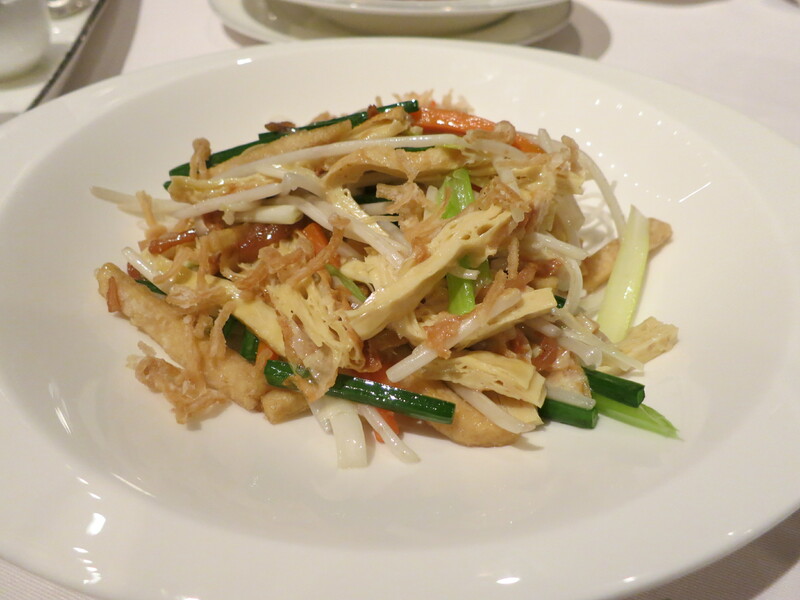 Meanwhile the stir-fried shredded vegetables with bean sprouts were delicately flavoured and very fresh. The addition of soft sheets of tofu played well against the crunchy bean sprouts, giving us a little bit of goodness after all the slightly less healthy dishes! I never understand why Chinese restaurants always serve the rice last. I know the saying goes ‘save the best for last’, yet what if by this stage you can barely fit another morsel of food in your mouth?! Who am I kidding? 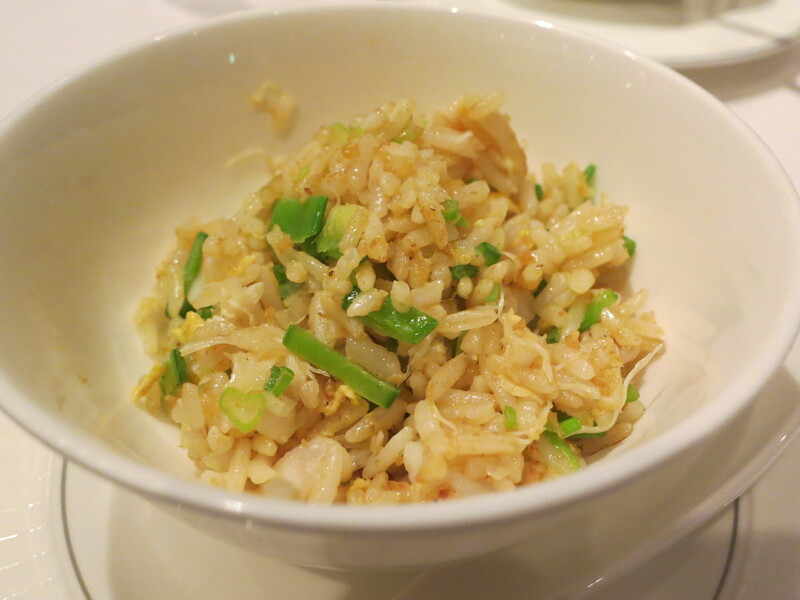 When the Lung King Heen lobster fried rice with seafood arrived, and I tasted just how incredible it was, I made an extra effort to eat every last grain. Of course, there was then dessert, and we all know that dessert occupies its own little space in our stomachs (perhaps the paunchy bit at the front that we can never get rid of?!). 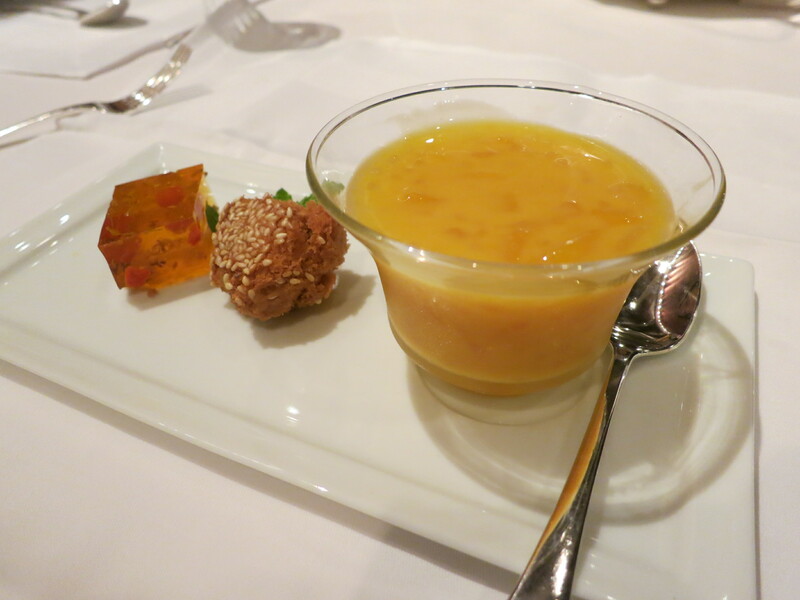 We tried the chilled mango and sago cream with pomelo – a refreshingly light end to a rather heavy meal. 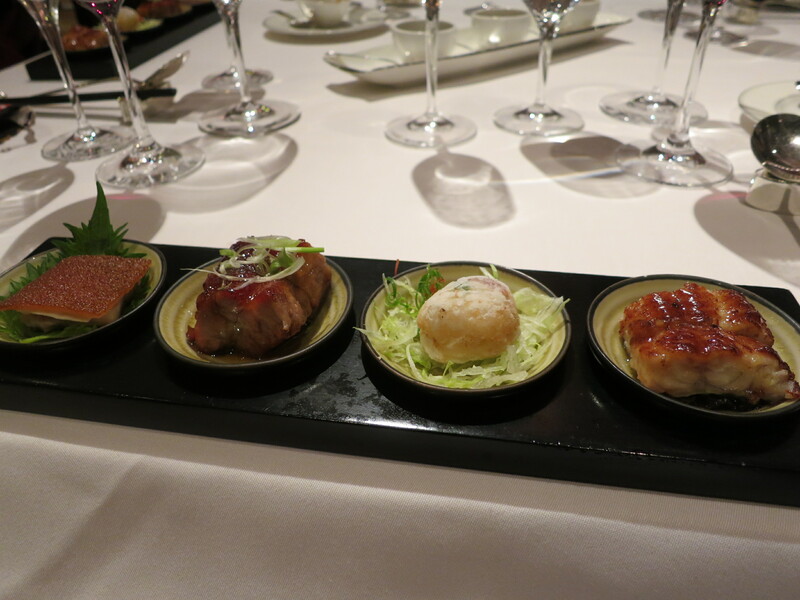 Service at Lung King Heen lived up to its three-star status throughout the entire evening. Despite dining with the lovely PR ladies, I noticed that service for the other diners was just as exceptional; plates were changed between courses, advice and detailed descriptions of dishes were given where necessary, yet we didn’t feel suffocated at all. When the bill arrives, remember its three-star status, take a deep breath, and think about the delicious food you’ve just eaten. An average meal is likely to cost around $1500 per head, perhaps more if you fail to resist the Champagne cart… Definitely one to recommend. Well Quentin, next time you’re in HK you know exactly where to go! 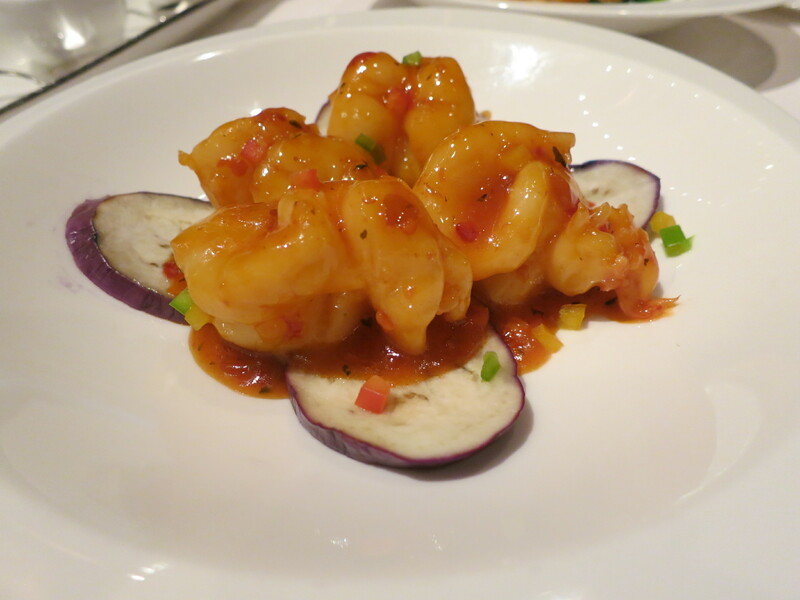 Sadly, I went to Lung King Heen based on your recommendation and I am afraid that it was average at best, there was no wow factor in the food or the service. Hi Wilma, thanks for your comment and sorry to hear you didn’t have a good experience. I guess every dining experience is different. What is your favourite Chinese restaurant in HK? Let me know if you have any recommendations I could try.